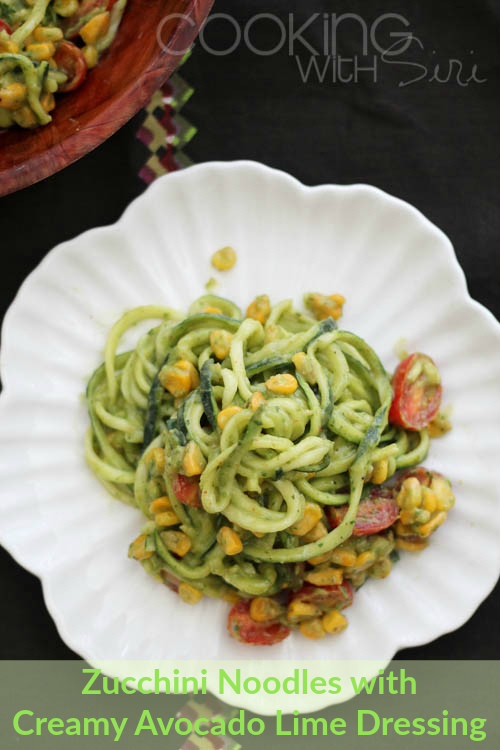 Fresh zucchini noodles (zoodles) tossed with lightly sautéed corn, cherry tomatoes and in an easy avocdao-cilantro-lime-chilli dressing. A fun way to incorporate more veggies and also an healthier gluten-free alternative to our traditional noodles/spaghetti pasta. Being a vegetarian, I am always looking for new ways to incorporate vegetables into our diet. Having read so many articles about a vegetable spiralizer, I ordered one couple of weeks and played with a vegetable noodle recipe past weekend. Oh boy, what fun it was. I loved the texture of the zucchini noodles and how brilliantly they took the flavors from the avocado-cilantro-lime dressing. Along with some sautéed corn and cherry tomatoes, today's recipe Zucchini Noodles With Creamy Avocado Lime Dressing was a total winner. I know for sure, I am going to make this again this week and many weeks to come. Zoodles, as they are endearingly called can be easily used in all the recipes that call for pasta noodles/spaghetti. Zoodle Mac n Cheese anyone? Pad Thai? with Tomato Sauce? Noodle Salad? Soup may be?....countless possibilities! Not just Zucchini, the spiralizer can be used with carrots, long radishes and yams. It is such a cool kitchen tool and very easy to work with. Just trim the edges of the vegetable, insert into the funnel-like opening and twist, twist, twist. As simple as that. The awesome folks at Recipe Redux have challenged us to cook veggies in different shapes and forms. What more fun than Vegetable Noodles. Isn't it? Heat the oil in a medium skillet over medium-high heat. 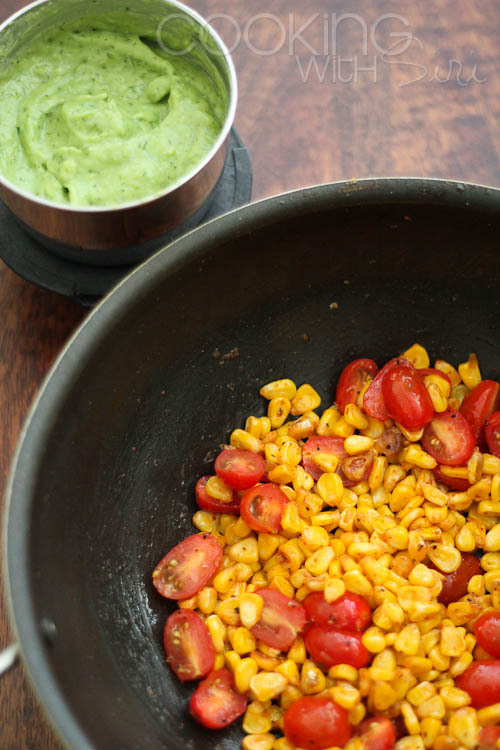 Once oil is shimmering, add the corn and season with salt, pepper, and chili powder. Cook for 5 minutes or until corn is cooked through and fork tender. Set aside when done. Place all of the ingredients for the sauce into a food processor and pulse until creamy. Taste and adjust, if needed. 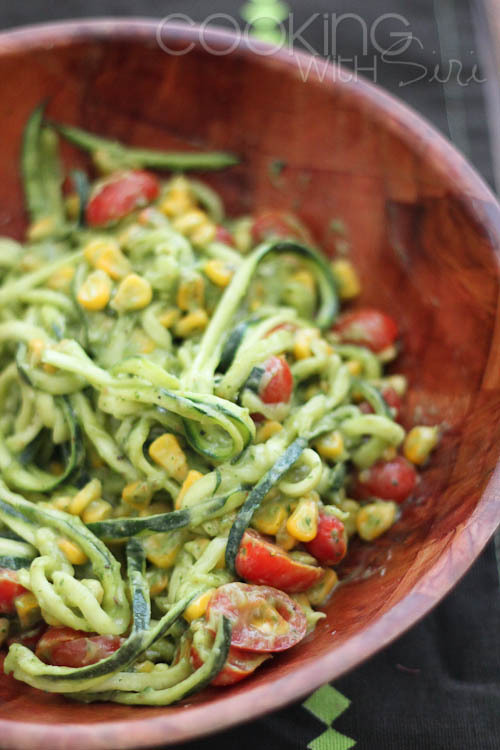 Place your zucchini noodles into a bowl, pour over the creamy sauce, corn and tomatoes. Gently toss everything together and Serve. Did you like this recipe? Are you craving for more? Keep in touch on Facebook, Twitter, Pinterest and Instagram for new post updates and more. You can also Subscribe to Cooking With Siri feed and check out the Recipe Index page for ideas. Happy Cooking! That creamy avocado dressing sounds amazing! Will have to try for sure. This creamy dreamy sauce sounds amazing! I'm all about some avocado!!! I usually only have italian style sauces with my zoodles but this will have to change!! This looks SO yummy! 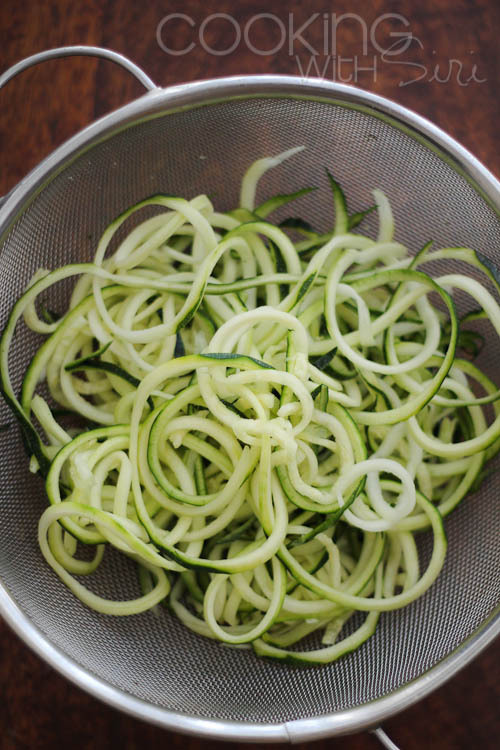 We love zoodles!